Henry Wilson Smith was usually known as “Tas’ or ‘Tassy’ for unknown reasons. Henry Wilson Smith, usually known as ‘Tas’ or ‘Tassy’ (for reasons unknown), was born in Featherston in 1886. His parents were Frederick and Louisa, married in 1885. They had four children, joining another four from Frederick’s first marriage. Frederick Smith served as Featherston’s constable from 1882-1896, and later policed in Carterton. He died in 1904 as a result of his gig capsizing near Gladstone. It’s likely Henry started school in Featherston. He is memorialised (as ‘Tas’) on the Carterton District High School roll of honour. His early working life is unknown but he was probably involved with horses as his later working life and interests showed. He was a huntsman with the Wairarapa Hunt Club and a clerk of the course for Masterton Racing Club. He worked as a horse-breaker and was employed by the Vallance family at ‘Kahumingi’ near Tauweru before the war. Henry was a well-known local boxer, becoming heavyweight champion of the NZEF in Egypt, beating Mastertonian Alf Iggulden in the final. He enlisted on 11 August 1914, becoming a mounted rifleman, service number 11/378. He was immediately promoted sergeant, perhaps because of his previous service in the Wairarapa Mounted Rifles. 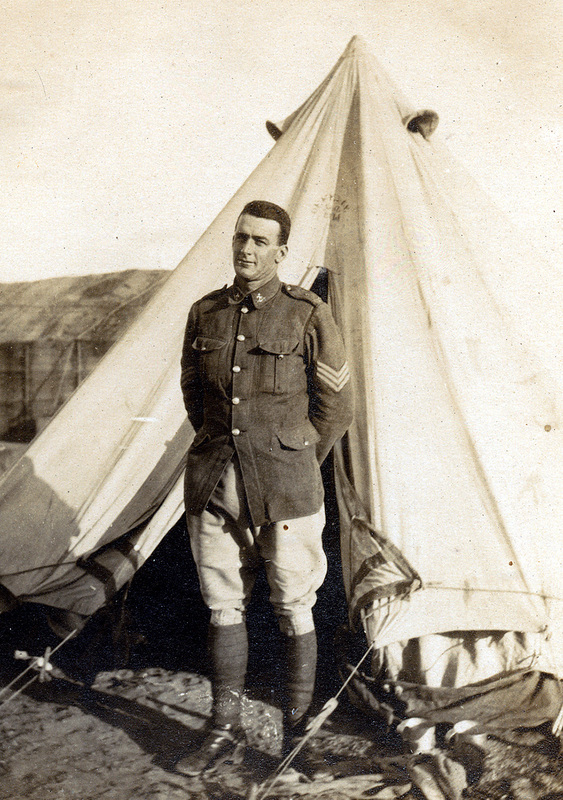 Part of the Main Body, Henry arrived in Egypt along with his Wellington Mounted Rifles comrades. They shipped to Gallipoli in May 1915 in time to see off a huge Turkish attack. Soon after, on 28 May, an attack was made by the Canterbury and Wellington mounted regiments on No.3. Outpost, north of Anzac Cove. The original attackers were relieved by Henry’s unit, the 9th Squadron, during the night of 29 May. Overlooked by the enemy, subject to rifle, machine gun, grenade and artillery fire, the besieged New Zealanders held on grimly, repelling infantry attacks through the day. The Turk-dominated battleground prevented any help reaching the Wellingtons. Finally, on the night of the 30th, the depleted 9th Squadron was replaced and the sensible decision to evacuate the position was taken that night. Sergeant Henry Smith was one of 20 killed in his squadron, another being Lieutenant Norman Cameron. Smith was mortally wounded while throwing Turkish grenades back during the fight on 30 May. His body was not recovered and he is commemorated on the Lone Pine Memorial at Gallipoli. His mother wrote to the Army in 1921, in the belief that Henry had been ‘mentioned in despatches’. Sadly, although an award may have been well-deserved, ‘Tas’ Smith received no recognition for his bravery.